Led by former ESPN The Magazine editor-in-chief Chad Millman, The Action Network a veritable one-stop shop for all of your sports-gambling needs, be they professional or casual. I've only been a member of The Action Network for a month, and the site has already helped me bet smarter and make a profit. Unlike other betting sites, The Action Network understands, and embraces, the degree of chance that comes with gambling money on sports. Subscription plans run from $6.99 per month (billed annually) to $7.99 per month (billed monthly). For a limited time, you can sign up for an annual plan for 60% off ($3.33 per month, billed annually). Read on to see how the sports-betting site has helped me bet smarter, bet better, and make a profit. Whether you're a high roller at the card table or you make casual bets with friends, gamblers are always looking for an edge. I started my gambling career in middle school, making $5 bets with friends who didn't know the finer points of how a spread worked, and using their lack of knowledge to my advantage. If Duke was a six-point favorite over North Carolina, I would offer a friend the Tar Heels at a pick'em, shake on it, and more times than not, collect my $5 the next day. Gambling was easy because I always had an edge. As I've gotten older and the gambling gods have caught up with me for these past sins, making money on games has gotten more difficult. Simply put, everyone is smarter, and edges are harder (but not impossible) to find. 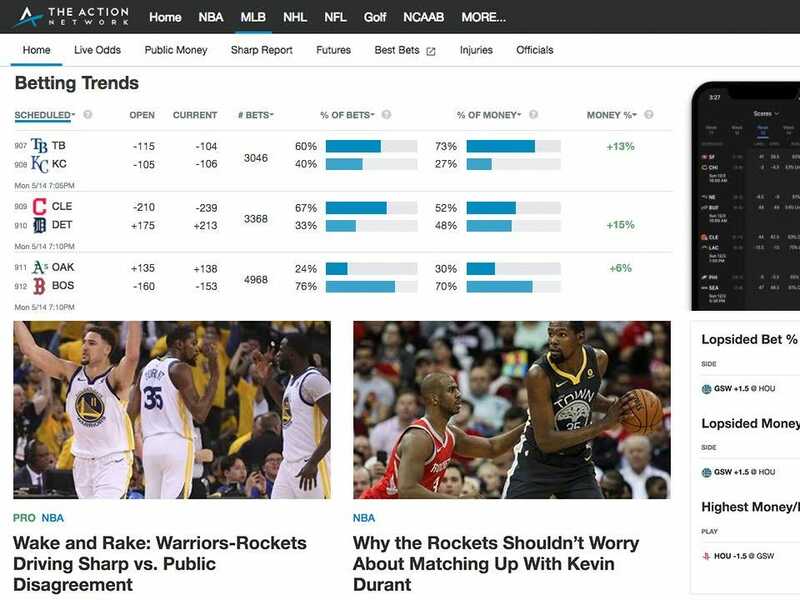 Led by former ESPN The Magazine editor-in-chief Chad Millman, and CEO Noah Szubski, The Action Network offers a new edge for sports bettors looking to beat the odds and turn a profit. Whether you're looking to find out the lastest odds from Las Vegas, which teams are receiving the majority of bets on a particular outcome, or get an analysis from a gambler's perspective, consider The Action Network a one-stop shop for all of your betting needs. I've only been a member of The Action Network for a month, and the site has already helped me bet smarter and make a profit. Even for casual bettors who like to put $20 or $50 down on a game just to have a rooting interest, the service is a remarkable value. And with the Supreme Court ruling in favor of New Jersey on May 14 that the federal ban on sports betting is unconstitutional, it's likely that this year will be the best yet for casual gamblers. The first and most obvious thing you get with a membership to The Action Network is access to a ton of information. Every day, the site has articles and the latest stats to help you make a smart decision when placing your bets. What impressed me most is that this analysis isn't restricted to the biggest days on the gambling calendar. While you'll find amazing coverage from The Action Network heading into any golf major, the Kentucky Derby, or any NFL Sunday, the site doesn't shy away from covering afternoon baseball if there's a potential edge to be gained on an over/under bet. The Action Network also makes it easy to track where the money is coming in on every game - a phenomenal service for contrarian bettors. As a person who sometimes enjoys putting a few dollars down on whatever game happens to be on at the bar, this aspect of the site has been a boon for me - rather than throwing $20 into the wind and hoping for the best, I can make sure that I'm putting my money on the smart side. Even if the bet turns out to be a loser, I can sleep soundly knowing it wasn't for lack of information. Another impressive feature of membership with The Action Network is its app, which makes tracking your bets easier than ever. For anyone who bets with any sort of regularity and wants to track their bankroll, the app alone is worth the price of a membership. Through The Action Network's app, all of my bets are in one place, and I can receive push notifications to let me know once the game has gone final. The app has also made me smarter with my money on a very basic level as a gambler. As any bettor can empathize with, I have a tendency to chase lost money - if I had a bad early slate of football games, I'd bet bigger on the night games and hope to make my money back. Conversely, if I had won a bunch of money in the early games, I'd also bet bigger on the late games - I was playing with house money! Using the app, it's easier to track my progress throughout the day beyond how much money is remaining in my account. It makes it feel more like investing and less like watching my bank account swell and dwindle at random, and that slight distinction has made it easier for me to keep my emotions from getting the best of my wallet. Making a profit is never a guarantee when gambling - that's why it's called gambling. One of the biggest factors that sets The Action Network apart from other betting sites is it understand betting is ultimately a game of chance. Before I started using The Action Network to keep track of my bets, I was bombarded with advertisements whenever I went to look up lines - different sites selling their picks as guaranteed winners and promising to reveal a hidden trend that had gone 24-2 over the past three seasons of Monday Night Football. These were not the types of ads that I'd ever click on. Unlike other betting sites destined to overpromise and underdeliver for eternity, The Action Network understands, and embraces, the degree of chance that comes with gambling money on sports. There are no sure things, but there is math, and there are trends, and if you head into a night of betting armed with more knowledge than the average Joe, you have a chance of leaving with a profit. Learn more about The Action Network and its monthly and yearly subscription plans here. This article was originally published on 5/20/2018.